I have been reading Janssen's blog since about 2009. She is one of the few bloggers I knew in real life before blogging (we were freshmen together at BYU). Janssen is a voracious reader, and although she tends to read more Young Adult than I do, our tastes in nonfiction definitely overlap (it's because of her that I picked up The Happiness Project, and you all know how much I love that book). I love reading all of her reviews, regardless of whether or not I think it's a book I'd actually read. She has a captivating way with words. In my dreams, I can read as fast as Anne Bogel. She cranks through hundreds of books every year, and her summer reading guide is legend (and she's read everything she recommends). She tends to read a lot of nonfiction, classics, and women's fiction, and while our tastes don't always sync, I love reading her posts because they are intelligent and interesting (and the discussions and recommendations she gets in the comments section are amazing). One of my favorite series on her blog is her literary matchmaking series where she considers three books a reader loved, one book they hated, and one they're currently reading and then gives them new recommendations. Her suggestions are always fresh and unexpected, and it's pretty obvious from them how widely she reads. Melanie reads a lot, and she is not afraid of long, dense, intimidating books. (She has this really impressive goal of reading a biography of every U.S. president, and she's made a lot of headway so far.) For the most part, we have similar reactions to the same books (although she didn't like Better Than Before, and, well, you know I loved it), which helps me know that if she recommends a book, I'll probably really like it. Besides that, she travels a lot and takes beautiful photographs. She recently moved to Utah, and we met each other in person earlier this year. What a treat. Carrie definitely has her preferred genre (nonfiction, especially biography/memoir), but one of the things I really admire about her is that she's constantly pushing herself to branch out and try new genres. Consequently, I hear about a wide variety of books from her. She also keeps her blog very up-to-date on her reading status, so you always know exactly what's she's just finished, what she's currently reading, and what's in the queue. Out of all the blogs on this list, this is the one that is easiest to recognize as a traditional book blog. Melissa reviews pretty much everything she reads. Some of the reviews are long, and some of them are grouped into little mini-reviews. But you can be pretty confident that if Melissa's read it, then there's a review of it. She reads a lot of classics, and I appreciate knowing there's somewhere I can go to find a review if I'm trying to decide if it's worth it to delve into a long one. Even with it being a review-heavy blog though, you still get to see a lot of Melissa's personality, and I really like that. I haven't been reading Becca's blog for very many months, but enough to know I like her style and I like seeing what she's reading. 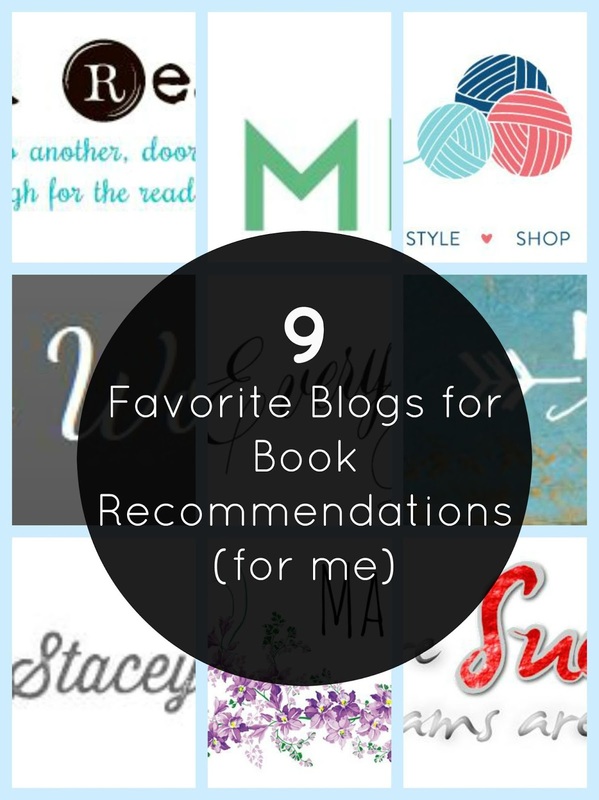 Like Maybe Matilda, Becca does roundup posts featuring the books she's read during the month. I love it that she usually includes any chapter books she's read to her young daughter. Those totally count! And it gives me ideas for what to read to my kids (in fact, it's because of her high praise of Pippi Longstocking that it's up next for us). Stacey is another blogger who combines her love of reading with motherhood. I love seeing how the two intersect in her life and how she always makes time for reading for herself. She has many insightful posts on the value of reading. (And, I know this is supposed to be about how I find recommendations for myself, but she also shares her family's favorite picture books every month, just fyi.) I enjoy her "in this moment" posts, as well as her mini-reviews of the books she's read. Suzanne and I often joke about being kindred spirits. We've never met in real life, but if we ever do, we're just sure we'll be great friends. Suzanne is getting her master's in literature (along with being a mom to two little boys), so of course you know she has good taste. Besides doing roundup book posts at the end of every month, Suzanne takes what she's been reading and applies it to real life in thoughtful, intelligent posts (she even applied The Book of Strange New Things to her own marriage). She probably likes fantasy and sci-fi a little more than I do (okay, she definitely does), but our preferences intersect at many other genres. As you can see, these bloggers represent a wide range of reading tastes and interests. There's young adult, modern fiction, nonfiction, biography, fantasy, and science fiction among them, so it's highly likely that at least one of these blogs (if not more) will appeal to your personal preferences. Happy reading! What's your go-to blog(s) for book recommendations? Wow, thanks for including me on your list! I'm so excited to check out the others you have listed here; I'm only familiar with a couple of them, and I always love finding a new blog that talks about books. I recently discovered 101books.net. The author is making his way through the Times 100 Best Books list. Of course! I value your opinion so much! I love a good mystery too, and I'm unfamiliar with that magazine. Is it something that comes in the mail or do you read it digitally? Also, I'd love to know what your favorite kidlit blogs are in case I'm missing out on something good! So flattered to be a part of this great list! And just to prove we are kindred spirits, I had a very similar post to this one planned for August (but I might hold off until I've had a chance to explore some of the other blogs you've listed here I'm unfamiliar with, because obviously since you've recommended them I need to be following all of them :). I also like Everyday Reading. and Here in the Bonny Glen, which is Melissa Wiley's blog, is a favorite of mine as well. Also yours! Sunlit pages is great. By the way, I like the site redesign. I hope I'm not *that* friend, the one that compliments you on your haircut 3 months later. I've just been reading mostly on my feed reader, and happened to stop by tonight. Looks great! I haven't read Melissa Wiley's blog very much...does she give mostly children's recommendations? Or do you get ideas for yourself as well? Oh, and thanks! I actually have something a little more exciting planned for the header so check back again in a couple of weeks! Thank you so much for including me! There are so many excellent blogs to check out here. I love seeing your recommendations! I hope you find a few new ones to enjoy! Wow, what a surprise and honor to be scrolling through and see my blog highlighted. You made my day, Amy. You'd definitely be on my top book blog list, too! I always enjoy seeing what you're reading, Carrie! I'm glad we've become virtual friends!